Labour Day weekend is usually a big money maker for Shuswap Lake businesses, but low water levels in the lake this year could make business dry up. The upcoming Labour Day weekend is one the busiest for houseboating on Shuswap Lake. But this year, water levels are unusually low, and that means boats can't access some marinas, and in fact, some docks are sitting on dry land. "Where this really has an impact is on the tourism businesses that are reliant on traffic from the lake," said Neil Millar, president of the Sicamous Chamber of Commerce, and a houseboat business owner himself. Millar is referring to the many businesses that serve houseboats. They might be restaurants that feed people who dock their boats, as well as summer rental properties that rely on boat access. He says they are suffering this year in addition to some of the houseboat businesses themselves. 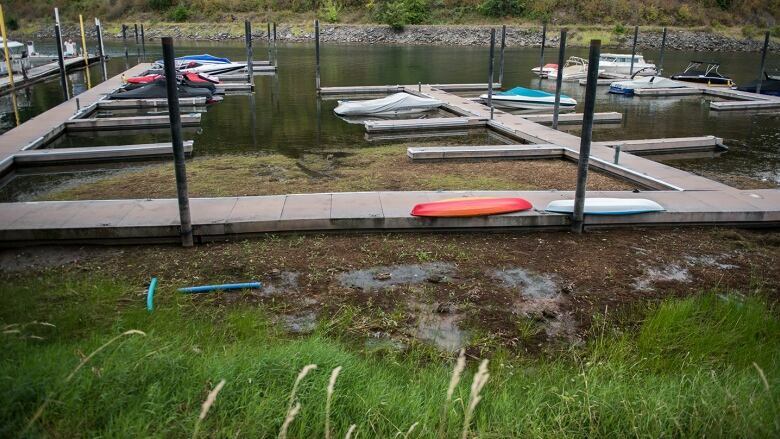 As well, public facilities like the Salmon Arm Wharf and Marina are experiencing low water levels too, which means tourist facilities on land are cut off from potential customers on their boats. As boaters who regularly go to Shuswap Lake know, low water levels happen on an almost annual basis. But with the record-breaking heat and drought conditions, 2015 has been particularly bad. Millar says the solution is to get some dredging done at key locations like the Sicamous Channel. "The Channel needs dredging — desperately," he said. "It's a huge tourism facility. It brings, of course, a lot of money into the community and into the region." "It definitely needs to be done, and it seems that it's a very, very difficult thing to get done." Millar says that dredging work for individual, privately owned docks and facilities is the responsibility of the owners, but he wants to see senior government and local communities work together to fund dredging work at key places like the Channel. He says this work used to be done on a regular basis, but infighting between various governments and agencies has prevented it from being done more often. He says the annual problems with water levels will only get worse until dredging is done more regularly.